I went to the Mike and Key Ham Fest down in Puyallup, WA in the spring of 2015. Before I showed up there, I had been thinking about a GMRS license and radios for the family. I picked up a Kenwood TKR-820 repeater, already programmed to the GMRS repeater frequencies. Kenwood TK-790/890 control head options, basic and advanced. I also picked up 4 Kenwood TK-890 radios. I got a "good deal". They didn't come with microphones, but I didn't see that as a big deal...while I was at the ham fest. Once I got home, I found out differently. This particular breed of radio, as a result of the genius of Kenwood, doesn't have a standard microphone plug. As a result, microphones cost $65+ each. And the aftermarket doesn't make them. Stupid. I found a lot of 7 on eBay, for a reasonable price, so now I'm in action. Over the past weekend a friend of mine asked if I would help him convert his Kenwood TK-890 mobile to work on the ham bands. I wasn't sure how successful we'd be, since most every online search came up with at best little information or at worst flat out statement saying "Nope, can't be done." As it turns out, it can't be done. Kudos to Time K for his notes posted to Radio Reference [cg, I also placed the relevant content at the end] which gave enough hints to make this happen. In general this is how it went. 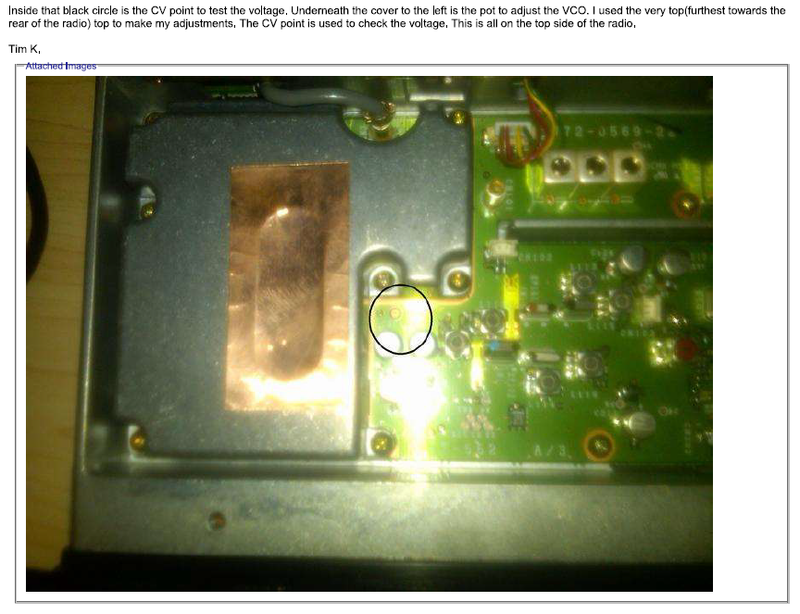 My friend wanted his radio to work on the Bay-Net repeater system, which operates 443.225 with a +5 MHz TX split. TX was fine, but RX was giving a steady "beep-beep-beep..." which indicates PLL unlock. In the PLL section, under the copper foil, [cg, for the record, mine weren't) are three adjustment pots: A = TC302, B = TC303, and C = TC301. (Don't ask why they're out of order.) According to the Service Manual, Pot A sets the PLL for the low end of the receiver range, Pot B set the high end of the receiver range, and Pot C sets the TX PLL. The goal is to monitor testpoint CV with a voltmeter and adjust for minimum voltage during RX and TX. This requires reprogramming the radio's test frequencies to match the band of interest, so you'll need the [KPG-44] software and [KPG-4] cable. Once we had the PLL voltages minimized for RX and TX, I found that the radio's TX frequency was way off, so a frequency alignment was needed. This again required the [KPG-44] software - for some reason we couldn't get the radio in to Panel Test/Tune via the control head. It was easy enough with the KPG, once we realized you need to press "Enter" to lock the modified value. Other things like adjusting the BPF and checking deviations should be done. In the end, the conversation was very easy and the radio is working well on the UHF amateur band. "The VCO can be adjusted fairly easy with a volt meter. You just program your highest and lowest frequencies, monitor the VCO steering line voltage, check high and low (both TX and RX) and see if the voltage stays within specs. There are tweekers for both TX and RX to achieve this. And yes, if you lower your VCO's range, you will lose the top freqs, the VCO can only swing so far."